In the story Underwater Adventure, Tiger drops his special watch in the pond in the park. Max and Ant set off to rescue it in their new invention, the Super Micro-Submarine. But it does not go to plan when they are chased by some water-beetle larva and end up stuck at the bottom of the pond! Find out if Cat and Tiger can find the spare part they need to fix the submarine in time, in Cuckoo Trouble. 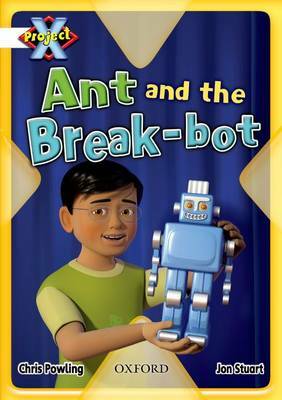 Ant gets inventing again in Ant and the Break-bot. In this story the children build an amazing, break-dancing robot to enter into a competition. Find out about man's attempts to fly, from Leonardo da Vinci to SpaceShipOne, in the non-fiction book Flying Machines. Then read about some incredible inventions that help us explore the most extreme environments in Extreme Exploring Machines. Each book comes with notes for parents that highlight ambitious words or concepts in the books, prompt questions and suggest a range of follow-up activities. The Inventors and Inventions Guided Reading Notes provide step-by-step guided reading support for each book in the Inventors and Inventions cluster, together with guidance about comprehension, assessment for learning and vocabulary enrichment. Hands-on follow-up activities, plenty of writing opportunities and cross-curricular links are also provided for each book.